I have a large container in front of the middle brick divider that is between the two garage carriage doors. 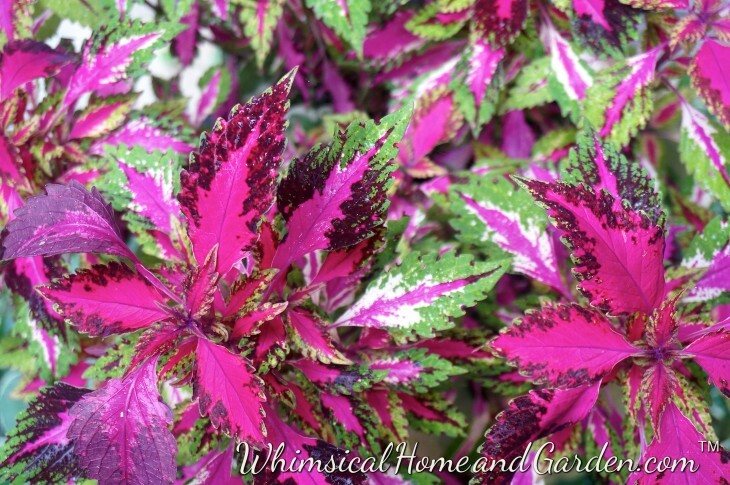 I usually plant it with either a bright Coleus or a Persian Shield. There is already some perennial vinca growing that cascades down the sides. The pot has developed a pretty patina of moss over the years and is one of my favorites. Several years ago after I planted I noticed a rather large hole in the pot, with a plant slightly displaced. I knew that I hadn’t created it myself when watering, as I use a fine spray. When I reached down to refill the hole and reset the plant I was almost scared out of my wits. A quite large frog jumped out of the hole, and just stared at me. Fortunately I am not afraid of frogs, and know they are good to not only have in the garden, but their presence is also an indicator of a healthy environment. He seemed unafraid of my presence, even as I placed the displaced plant in a different spot. I figured he would leave eventually. Next day I was watering, and out he hops by the pot rim so he could get a shower! This continued all summer long. I have no idea where he went for the winter, but the next year he was back, and a bit larger. So I planted around his hole, and every morning he would greet me. This year he was back again, and is so used to my presence, that I could even take his photo while he posed! He really cracks me up…..looks like a grumpy ole man. So here he a photo of my frog buddy. I tell you, the animals around here have a cushy life. OK, now stay with me………below is not a snake!!!!! 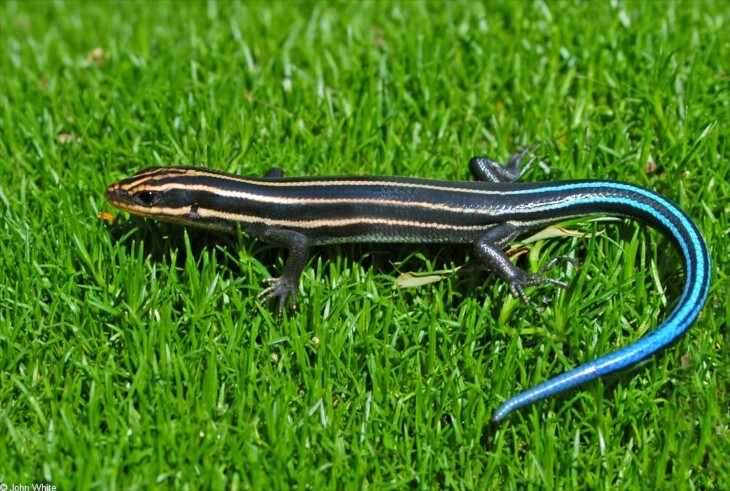 Just a cute skink. Now you all know I am terrified of snakes, but these guys are fascinating. They are Skinks, and we have several we see on a regular basis. Usually their body stripes are quite iridescent as well. They sun themselves on the rocks around the garden and are very fast! They are also very good to have in your garden……eat big bugs like grasshoppers. We have one that we often see on the brick near the front door. They are not poisonous, but it is best not to handle them. As a defense mechanism they might “give up” their tail, and although it does not hurt them, it takes a lot of energy for them to grow it back. Last summer we saw a few that were orange and so pretty as well. Today it is raining, again. This summer I would have been better off reporting when the sun decided to shine, and that was a real event! The record rains this year however, have allowed for the newly planted garden areas to get really established without the stress of our normal very hot summers. I have only watered a few times all summer. Amazing! A couple of plants that do not like so much water are struggling a bit, but if our autumn is a bit drier I think they shall return in the spring. 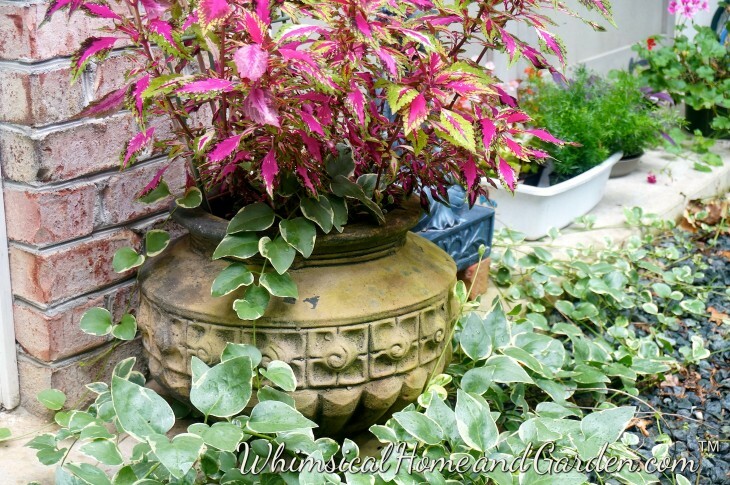 The same pot where Mr. Grumpy Frog stays in the summer, planted this year with Coleus. It was sprinkling when I took this and the photos below this morning, and he was out but wouldn’t show his face. Oh well! See the few plants in the background? Didn’t get planted. I have plans for them, and will share after the weekend. 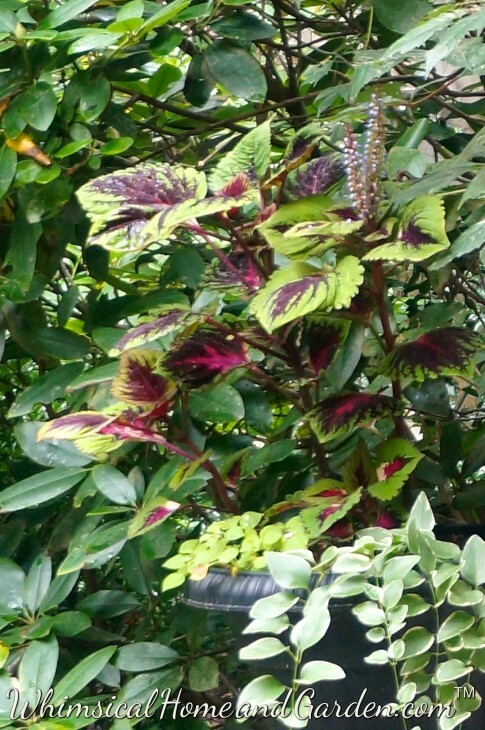 Here is a closeup of this coleus (Grace Ann). The color is bright fushia and is one of my favorites. 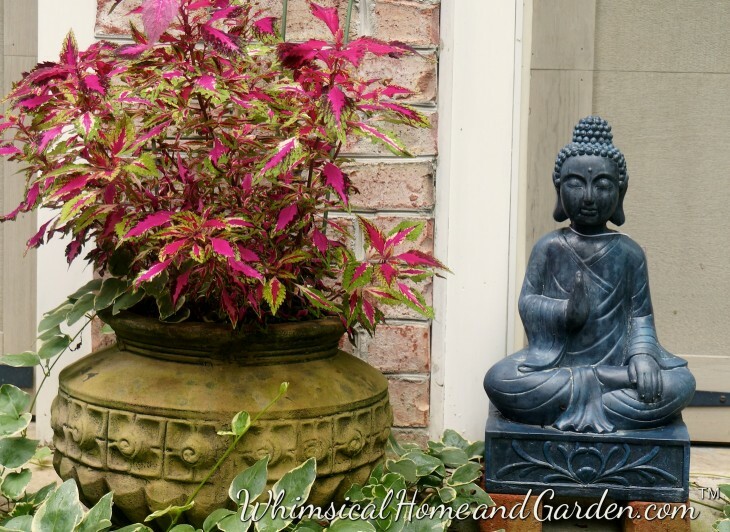 On the far end of each garage carriage door are a pair of large black urns and this year I planted them with coleus (Trailing Salamander), impatients, and varigated vinca. In the background a rhododendron and the climbing vine Virginia creeper which grows up the brick on the front of the garage. I just had to share my now in full bloom hydrangea, which has reached a height of almost 13 feet!!!!! 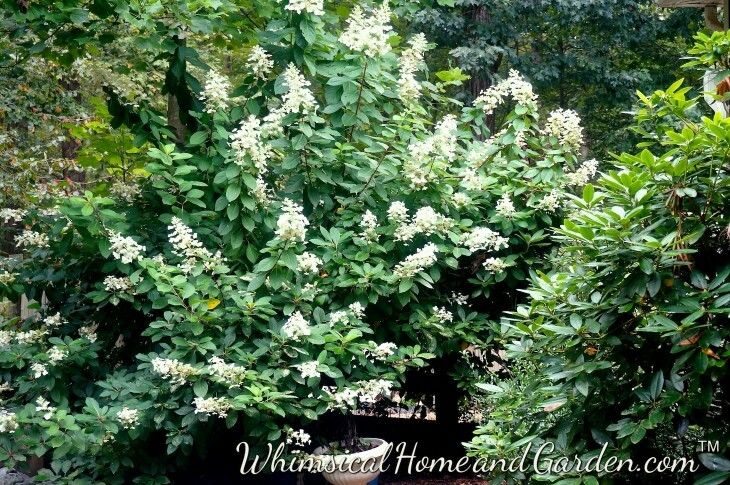 I pruned it this year, and the longest branches were about 5 feet. It obviously loved all the rain more than I have. 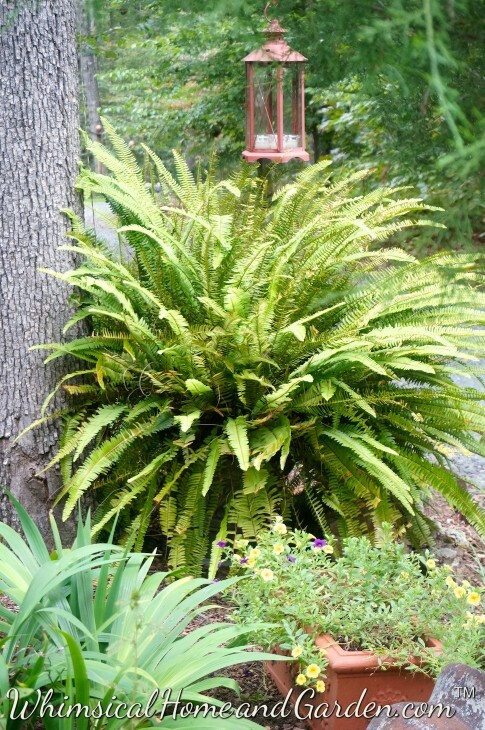 Another water and shade loving plant is this Kimberly Fern. It is 5 feet tall. It now dwarfs a fairly large lantern. Both along the driveway in front of the house. 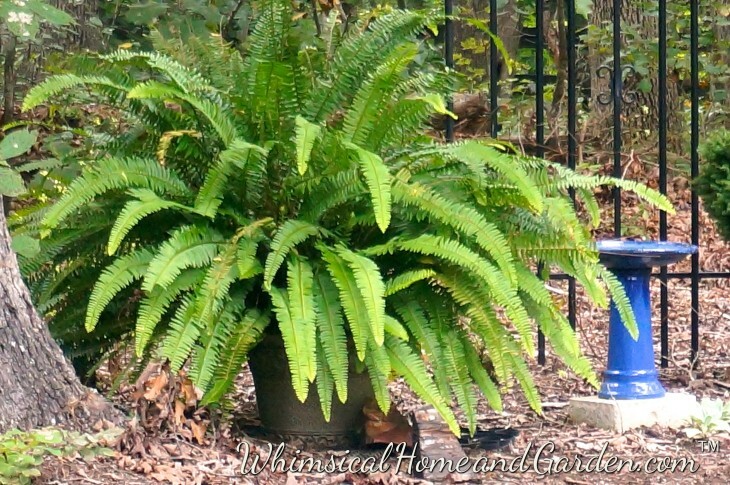 This is a Boston Fern. 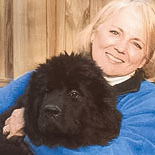 I overwintered this last year in the Newf room, and by spring it was messy, shedding a lot. It was pretty scraggly by the time I placed it in the garden, but with all the rain it thrived. It is about 3 feet tall right now. Hi Penny, I think you are correct, he is a toad. However, did you know that all toads are frogs? Like you said, either way he is sweet, but grumpy. 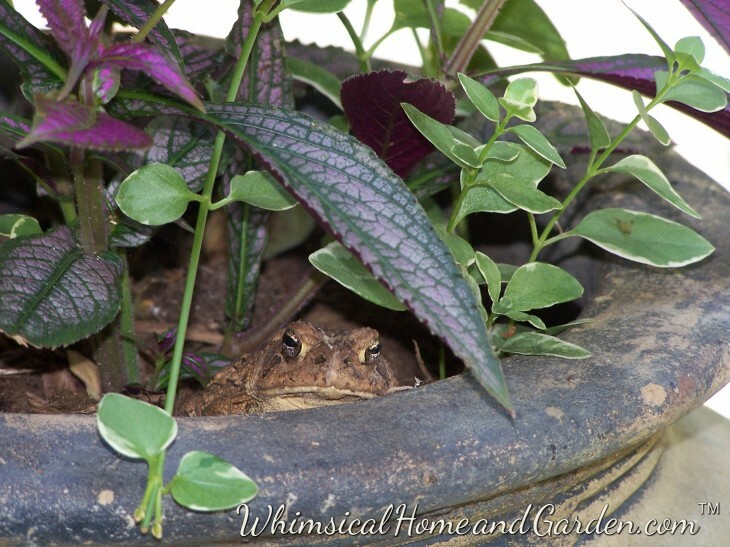 This morning he was very funny…..he hung his front legs over the edge of the pot while I was planting a small pot, indignantly waiting for his shower! He got one.I ran to get the camera, but he popped back down in his usual heads only pose.